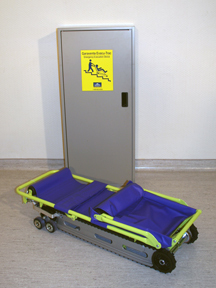 The Evacu-Trac evacuation chair is normally kept in a storage cabinet located near the upper stair landing, ready for use in an emergency situation. Remove the evacuation chair from the storage cabinet and place the unit on a flat surface. Grasp the handle and pull it up in a quick, smooth motion. This will lock the Evacu-Trac in the open position. Transfer passenger from their wheelchair to the Evacu-Trac. Three Velcro straps are provided for securing the passenger. These straps help immobilize an injured person or help transport a person with no upper body control. The lower torso straps allows a younger passenger to be well secured while being transported in the emergency stair chair . The Evacu-Trac brake is normally on. To descend the stairs, release the brake by slowly squeezing the brake lever. Descent speed can be slowed by reducing pressure on this lever. A governor limits the maximum descent speed to about 3' per second, allowing even a small attendant to safely transport heavier riders. It is recommended to use the inside of the stairway to allow room for other traffic and to make it easier to turn corners at stairway landings. On stairs, the tracks securely grip the stair noses and control the descent speed regardless of the stair covering. 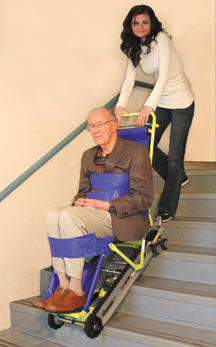 On flat surfaces, the evacuation chair can be pushed on its wheels as easily as a stroller. This features allows the user to be transported to an area clear of the emergency rather than to an area of refuge. Once clear of the emergency area, park the evacuation chair on a flat surface and engage the brake by releasing the bar.